Add these strategies to your techniques and your coyote count will rise. Coyotes are among the most vocal predators. They use howls to proclaim territorial boundaries, to let other coyotes know where they are and, in summer, sometimes just to make noise for the fun of it. Howls pinpoint areas where coyotes are bedding or loafing, so pinpoint the origin of the howls. If you can’t get the coyotes to howl, which can be difficult in some East Coast locations, use firsthand scouting to find hard evidence of coyote activity. Don’t put coyote hunting off until after the holidays. The best coyote hunting takes place as soon as furs prime in late October for northern locations and November for the remainder of the country. If you’re hunting strictly to reduce coyote densities in an attempt to increase fawn production, begin calling even earlier. Why hunt early? You want access to the young pups that haven’t heard a call or felt the pressure of predator hunters. As the dog days of summer disappear, coyote pups become more brazen and bold, exploring on their own without the watchful eyes of mom and pop. 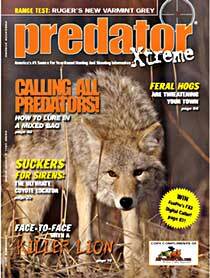 To overcome a coyote’s predisposition to paranoia, include confidence calls during a calling setup. My best confidence call is simply a long, drawn-out howl that says to other coyotes, “I’m over here.” After waiting a few minutes to see if a coyote will respond, I begin with a series of prey-in-distress calls, finishing the setup with a final howl. Sometimes the addition of opening and closing howls is all that’s needed to bolster a coyote’s confidence level. Most of us only have limited spare time to devote to coyote hunting, so check the forecast and choose your hunting days wisely. Instead of wasting fuel and time on days when the wind is forecast to howl, I trust The Weather Channel to direct me to the best days to be in the field. Try to avoid windy days, but if it’s your only option, set up in canyons, coulees and dense cover to increase the distance your calls will carry. Call in severely cold conditions. Coyotes, like all animals, require more calories to stay warm in the midst of a cold spell. If you live where temperatures plummet below zero, use the cold to your advantage. Deep snow can have a similar effect, particularly when combined with subzero temperatures. All predators have to work doubly hard to acquire adequate calories to sustain themselves. On your next predator hunt take note of how ranchers and farmers design entrances to fields and pastures. Notice that almost all have a main gate for visitors to use. Coyotes notice such things as well and shy away from busy routes and crossroads. Oftentimes you won’t be able avoid main-gate entrances, but once you get inside a pasture look for backdoor entrances to get you into unused calling sites and out of sight from the watchful eyes of paranoid coyotes. Take advantage of the new generation of electronic calls, particularly models that allow remote operation. By placing the speaker and sound downrange and upwind of your location, you divert the attention of the predator to a spot away from you. Remote calls allow you to focus the attention of coyotes away from your location as well as to allow you to manage the calls using a television-style remote. You can turn the caller on and off, increase the volume and switch calls in the middle of a stand to turn a reluctant coyote into a comer. The key to hunting limited territory relies on variety. Don’t use the same calling site, call and calling rhythm time and again. Doing the same thing repeatedly might work for awhile, but eventually even dumb coyotes will figure out something isn’t right, and avoid. There are huge numbers of prey-in-distress calls, and when you combine them with coyote vocalizations, you should be able to send a new message every setup for the next decade. If you have trouble being creative, use electronic calls with well-stocked, digitally captured sound libraries for variety. Professional callers like Gerald Stewart and Gary Roberson routinely use two or more calls during setups, with positive results. Roberson often starts out with a rabbit-in-distress, but switches to a higher-pitched call when he spots an incoming coyote in order to alert his calling partners of impending action. 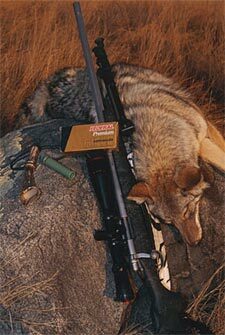 To increase your coyote count, practice shots from different angles. Since most hunters try to position themselves high above their calling site, practice shooting steep, downhill shots, noting that bullets generally impact higher than the point of aim. You can also increase your totals by practicing long-range shots to 400 yards and shots on moving targets. COOL TIP: An old tire equipped with a cardboard target and rolled downhill is a great way to increase your percentage of success on runaway coyotes. Slamming car doors, talking or banging gun cases in the back of truck beds can ruin a hunt before it begins. Have gear organized before arrival, instruct calling partners to whisper and park well away from a calling site to avoid alerting targets.